On 21st June, our students joined with many other young people and organisations for a celebration in Karenni Refugee Camp 1 to recognise Karenni National Day. Karenni National Day commemorates the day that Karenni State was granted independence. For this day, Karenni people across the camp and across the globe unite in their shared history and roots. 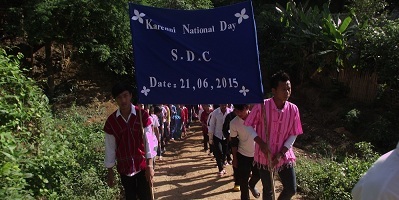 Every year the Karenni leaders remind their people of their history on the 21st of June. On this day, in 1875, the Burmese minister of foreign affairs, Kin Woon Mingyi and Sir Douglas Forsyth, a representative of the British viceroy, signed a treaty recognising Karenni independence. Despite this treaty, successive Burmese governments have ignored Karenni State’s independence and occupied their state. The 1875 agreement has frequently been cited during the long conflict to achieve independence. More recently, the main Karenni political group in conflict with the Burmese government, the KNPP , have changed their stance to demand for a general federal state within Burma. In the camp this year, Karenni People marched to the ceremony’s location. At the ceremony, leaders from our community spoke to the audience. They reminded the audience of the Karenni People’s history and encouraged them to maintain patience and trust that one day they will be able to return to their homeland. Many of the camp residents celebrated the day amongst their community. Our SDC is proud to participate in any event that recognizes our Karenni history and helps the preservation of our own cultures and traditions.